Submerged aquatic vegetation (or SAV) are rooted, vascular (having veins to transport fluids) plants that grow underwater or just up to the water’s surface, often forming large stands or “beds.” There are over a dozen SAV species occurring in the salt, brackish and fresh tidal waters of Connecticut. These plants lack structural support tissues, relying instead on the surrounding water for support. In addition, the stems and leaves have specialized thin-walled cells with large intercellular air spaces that provide buoyancy and support. Light penetration, water temperature and quality, substrate, and salinity are several of the major factors affecting SAV distribution and abundance. SAV beds provide food, critical habitat and nursery areas for many fish and invertebrate species. In addition, the distribution and abundance of these beds are associated with water quality. Nutrient enrichment of our coastal waters has led to decline of these beds throughout the world. The SAV most commonly found in Long Island Sound is eelgrass (Zostera marina). 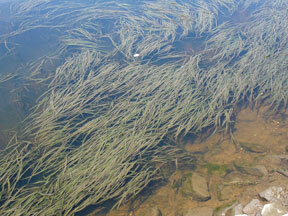 Eelgrass has long, ribbon-like leaves and is found in the saline waters of Long Island Sound. Beds of eelgrass are important habitat for many fish and invertebrates as well as an important food source for waterfowl. While having much shorter leaves than eelgrass, widgeon grass (Ruppia maritima) is one of the most highly valued SAV species as a food source for waterfowl. Tolerating a wide range of salinities, it can be found in the tidal creeks and ponds of the salt marshes as well as the shallower waters of the Sound. During the 1930’s “wasting disease” decimated 90% of the eelgrass in the North Atlantic. While eelgrass beds recovered in eastern Long Island Sound, few beds recovered in the central and western portions of the Sound, possibly due to nitrogen enrichment. The CT Dept. of Environmental Protection is working with partners to map eelgrass beds and look at long term trends. In brackish and freshwater tidal rivers creeks, and ponds, numerous SAV ‘s are found. 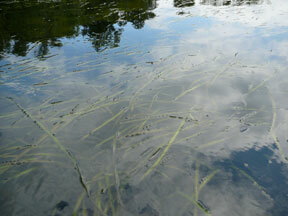 One of the most common species is wild celery (Vallisneria americana) – another important food source for waterfowl. Often confused with eelgrass, wild celery has a light green stripe in the center of its leaves and prefers lower salinity, while eelgrass is found in waters with higher salinity levels. SAV beds are among the most productive ecosystems on the planet, capable not only of harnessing the sun’s energy, but providing essential nurseries and food for an abundance of coastal and estuarine life. More than 20 types of commercially valuable finfish and shellfish feed in eelgrass beds at some point in their lives. Research in Chesapeake Bay has shown that the density of blue crabs is thirty times greater in grass beds than in unvegetated areas of the Bay. In addition, SAV beds help protect shorelines from erosion by stabilizing sediment and modifying currents, as well as filter nutrients from the water column. This submerged vegetation is also a valuable food for waterfowl and small mammals, providing nutritious seeds, roots and tubers. Some waterfowl names actually indicate the type of SAV they prefer. For example, canvasback ducks (Aythya valisneria) often feed in beds of wild celery (Vallisneria americana).